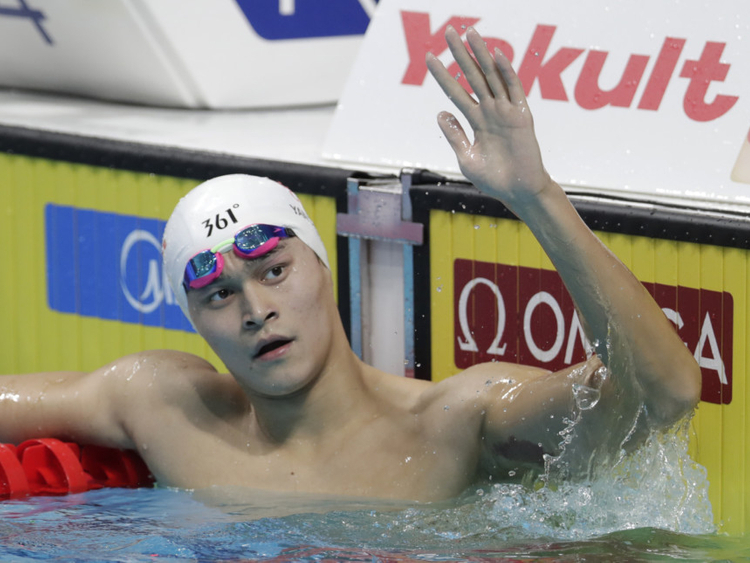 Chinese swimming star Sun Yang threatened legal action against a British newspaper on Sunday over claims that he faced a lifetime ban after allegedly clashing with anti-doping testers and smashing a vial of blood with a hammer. The 27-year-old Sun, who has won Olympic gold in the 200m, 400m and 1,500m freestyle and is also a multiple world champion, strongly refutes the accusations contained in The Sunday Times. The newspaper alleged that a confrontation took place after Sun - who was banned for three months in 2014 for taking a stimulant - missed an out-of-competition test on September 4 at his home in Zhejiang province. "A clash with anti-doping testers ended in him and his security guard using a hammer to smash a sealed vial containing the swimmer's blood," The Sunday Times reported. After the story broke, Sun's lawyer Zhang Qihuai issued a statement saying that the newspaper had "a malign intention" and "severely damaged Sun Yang's reputation and violated his privacy". "We reserve the right to file a lawsuit against the relevant international media which reported the incident," the statement added, according to the state-run Xinhua news agency. The statement noted that a doping panel for FINA, swimming's world governing body, ruled in Sun's favour on January 3 and said that a dispute occurred because testers for IDTM - the body which conducts tests - had breached several rules. That included failing to produce authorisation letters and a nursing licence, the lawyer's statement said. "And they fabricated an untruthful report claiming Sun Yang broke anti-doping rules and sent it to FINA." Zhang separately said Sunday in an interview, according to Xinhua: "Sun is entitled to reject any invalid doping test and safeguard the reputation and integrity of Chinese athletes." The Sunday Times also noted that FINA had cleared Sun, but said that the World Anti-Doping Agency (WADA) "has demanded to know more about the extraordinary events". The newspaper added that the doping panel "handed him (Sun) a series of cautions" and cited the panel as saying that his avoiding an anti-doping rule violation was "a close-run thing".